Not only has Obama declared that the Gulf is open for business and the food supply is unquestionably safe , the President and Navy Secretary Ray Mabus have sent ten Gulf Coast seafood products to 72 base commissaries along the East Coast as well as to the troops in Afghanistan and Iraq. The products include Gulf of Mexico fish, shrimp, oysters, crab cakes, and packaged Cajun dishes such as jambalaya . If you know and care about someone serving in the military, or know someone who shops at military commissaries, you might want to send them this article after you familiarize yourself with the following evidence which clearly demonstrates that the consumers of Gulf Coast food products are playing a dangerous game of Russia Roulette with regard to the safety of their food supplies. Barak Obama and his merry band of sociopathic minions (e.g., EPA Administrator, Lisa Jackson; USDA Director, Steve Wilson) might be able to deceive the public without conscience, regarding the ongoing and omnipresent dangers associated with the Gulf’s food supply. However, both scientists and food industry experts are very forthcoming in their accounts about the dangers posed by the consumption of food from the Gulf, even if their accounts are being totally ignored in the corporate controlled press. Obama, unwavering in his loyalty toward the globalist controlled corporations, failed to acknowledge Senator Crowe’s concerns as the President continues on his steadfast path of depraved indifference toward human safety and welfare in the Gulf. Quite obviously, in Obama’s mind, the people of Louisiana’s District 1 and the entire Gulf region are expendable, so long as BP, Halliburton, Transocean and Goldman Sachs realize ever increasing profits resulting from the spill. Parts one, two and three of The Great Gulf Coast Holocaust clearly demonstrated that several multinational corporations, with the full knowledge of support of the Obama administration, have wrongfully deprived 40 million Gulf Coast residents of their rightful restitution as well as their ecological heritage. Additionally, through the reckless use of of the dispersant, Corexit, the powers-that-be have poisoned the Gulf’s air resulting in untold catastrophic health concerns. And now, there is conclusive proof that the entire food chain of the Gulf is imperiled. While dining with his family at Vinnie’s Raw Bar Restaurant in the Charlotte, North Carolina area, Matthew Robertson found oil in his seafood. While covering the story, WBTV reporter Sarah Batista also acknowledged there was a black substance stuck to the inside of Robertson’s sea food . Additionally, Channel 8, Fox News, Winston-Salem, North Carolina, was told by Vinnie’s Raw Bar restaurant’s manager that he did, indeed, confirm the customer’s story and says he’s had problems getting oyster shipments because of contamination resulting from the oil spill . The Robertson account is just the tiny tip of this monumental iceberg. Despite the empty government assurances, food safety in the Gulf remains seriously compromised. The measures that the government is taking to ensure Gulf food safety would be laughable and provide some very amusing fodder for a Saturday Night Live skit, if it were not for the growing number of victims resulting from the BP event coupled with the impotent governmental response. The current method for detecting oil and Corexit contamination in Gulf seafood is a simple sniff test, in which FDA inspectors hold a bag of fish up to their nose and if the inspector does not detect any “strange odors, the fish passes the food safety inspection test and is eligible to be processed and subsequently sold to the public. Presently, the FDA says smell tests are the only way to detect chemical dispersants, as scientists have yet to develop an effective tissue test. 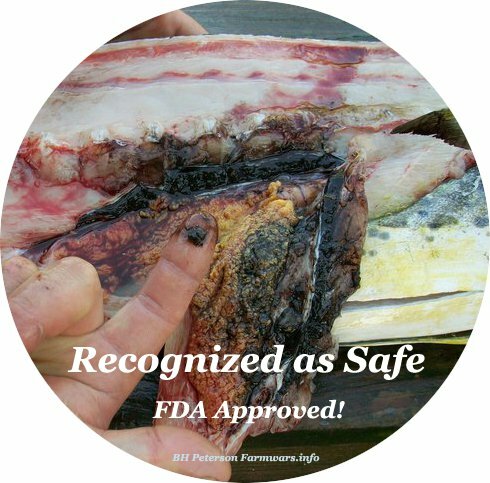 The sniff test doesn’t satisfy food industry workers and the obvious lack of scientific rigor is a de facto admission that the government cannot, or will not ensure the safety of Gulf sea food . If any group would have a motive to lie and misrepresent the safety of the food supply in the Gulf, it would be the very people who make their living from fishing the waters. Yet, even these people are stating in no uncertain terms that there are very serious dangers associated with ingesting the Gulf’s food supply. For example, Kathy Birren, owner of (Florida’s) Hernando Beach Seafood, told a gathering of concerned Gulf residents that the shrimp fisherman have every financial reason to declare the seafood of the Gulf to be safe…..” Birrren further proclaimed that “fishermen do not want to lose our credibility or deliver contaminated seafood to market and make people sick.” Chris Bryant, a Gulf commercial fisherman stated that “…if a commercial fisherman who makes his living off of those products doesn’t want to deliver them to the public, the public needs to know why.” Tracy Kuhns, a Louisiana Bayoukeeper, stated that“The tissue testing of this seafood is inadequate and testing for the toxic dispersants is non-existent .” While President Obama and other public officials continue to persist in their claims that the Gulf food is safe, these noble fishermen have clearly stated that the spraying of dispersants in the Gulf of Mexico is ongoing and they’re concerned that seafood pulled from impacted waters is unsafe for consumption. Similar warnings regarding the region’s food safety are appearing up and down the local Gulf Coast media on such stations as WLOX TV in Gulfport, MS. . Yet, Fox, CNN, CBS, ABC, NBC, etc., have not run one credible story on the dangers of food toxicity in the Gulf’s food chain. Although it is a different topic, which will be covered in part five in this series, the reader would be correct in assuming that a tightly interwoven, interlocking and overlapping corporate leadership as well as a multitude of common business interests exists between the national media, the oil companies and their Wall Street investors. And in this paradigm, the safety of the food consuming public does not matter. Scientists at the Dauphin Island Sea Lab shows oil from the Deepwater Horizon disaster has made its way into the Gulf food chain as well. These particular scientists have found signs of an oil-and-dispersant mix under the shells of tiny blue crab larvae in the Gulf of Mexico which is a clear indication that the unprecedented use of dispersants in the BP oil spill has broken up the oil into toxic droplets so tiny that they have easily entered the food chain [9, 10]. The most pronounced manifestation of these scientific accounts comes in the form of dolphins beaching themselves in several locations in the Gulf [11, 12]. In the Gulf, the dolphins are at the top of the food chain and what happens to these mammals will and is most assuredly happening to human beings. It is clear that the toxins have completed their trek up the food chain and the threat is just becoming realized. There is no end in sight for this ecological crisis, as new reports of an oil leak in the Gulf were reported in the national media on August 17, 2011. What was not reported were the additional 13 oil sheens spotted off the coast of Louisiana. This development has profound implications leaving scientists to wonder if the crisis will ever end . And, of course, BP quickly denied responsibility. The holocaust in the Gulf has grown to such proportions that the European Union Times reports that an extremely grave report was prepared for President Medvedev by Russia’s Ministry of Natural Resources in which the report warns that the BP spill will become the worst environmental catastrophe in all of human history and will bring total destruction to the Eastern half of the North American continent . The 13 month old Russian report is proving prophetic. Oil and Corexit, even when combined are a liquid base and as a result are subject to the normal hydrological cycle of evaporation and becoming a part of the rain cycle. As early as the 1970’s, scientists referred to this process, when it involved pollutants, as toxic rain. And as the Russian report predicted, there are multiple reports of toxic rain, related to the Gulf disaster as far as away Memphis, TN. . WREG TV in Memphis reported that local farmers are alarmed at the toxic substances (i.e., Corexit) raining down upon and destroying the local crop base. And while we are speaking about Corexit and oil based toxic rain, wouldn’t this toxic rain also be present in the grasslands of farms and be negatively impacting the grass that cows and other farm animals consume? Subsequently, the region’s cows eat grass which is being laced with this poisonous toxicity. Common Sense would seem to dictate that the beef and dairy grown in the region is tainted and these dangers are being visited upon the rest of the country! If this is the case, then all of us are victims of BP, their corporate partners in the Gulf and their friends in the President’s inner circle! Part five will clearly document that there are very sinister corporate forces which previously aligned themselves to successfully profit from this disaster and they did so prior to the spill. A careful review of the evidence makes it very likely that this event in the Gulf was, at minimum, is a case of criminally negligent homicide on the part of powerful corporate officials who have enjoyed the assistance and protection from the highest federal officials in our country. At worst, the Gulf oil spill was premeditated and could very likely end up being this generations Kennedy assassination. What can be said for certain is that Goldman Sachs, BP, Transocean and Halliburton had foreknowledge of the impending explosion a few short weeks before 11 men lost their lives on the Deep Water Horizon oil rig on April 20, 2010. How can I be so sure that these four corporations had foreknowledge of what to come? All one has to do is to follow the money trail just prior to the explosion. The odds of the financial positioning of these four corporations, prior to the explosion, defy the laws of chance. And certainly, one of motives for the explosion was undeniably greed and profit. However, the crown jewel of this conspiracy will surprise even the most ardent watchers of the New World Order and that is the topic of Part Five of The Great Gulf Coast Holocaust. (1) Julie Pace. Associated Press reported in The Washington Times. Gulf “Open for Business,” Obama Says. August 10, 2010. (2) Mary Foster. The Washington Post. U.S. military purchases Gulf of Mexico seafood, boosting an industry battered by oil spill. February 6, 2011. http://www.washingtonpost.com/wp-dyn/content/article/2011/02/06/AR2011020603941.html?hpid=topnews. (3). A.G. Crowe. State Senator District 1, State of Louisiana. January, 16, 2011. http://www.agcrowe.com/Portals/AGCrowe/Resources/Crowe%20Obama%20Gulf%20Letter.pdf. (4) WBTV, Charlotte, North Carolina. Man claims to find oil in oyster at Cornelius restaurant. June 10, 2010. http://www.wbtv.com/story/12680124/man-claims-to-find-oil-in-oyster-at-cornelius-restaurant?redirected=true. (5) My Fox 8. Oil Found Inside Oyster Served at Lake Norman Restaurant. June 20. http://www.myfox8.com/news/wghp-oil-in-oyster-100620,0,2378672.story. (8) Associated Press. Blue crabs provide evidence of oil tainting Gulf food web. August 10, 2010. http://www.nola.com/news/gulf-oil-spill/index.ssf/2010/08/blue_crabs_provide_evidence_oi.html. (12) Harvest Dream: A Chronicle. August 1, 2011. http://www.harvestdream.org/index.php?/archives/318-80-whales-and-dolphins-beach-themselves.html. (14) EU Times. Toxic Oil Spill Rains Warned Could Destroy North America. May 24, 2010. http://current.com/10su04c. Vote with your feet – LEAVE the US. So very sad! I grew up having a fish fry almost weekly. My dad loved to fish!! Now-I will not buy it from any source! If not the mercury then some other poison they are dumping in every waterway! Chemtrails also stay on my mind. Where is the poison going? All I can do is pray because there will never be another fish on my table! Just makes you want to cry! Who are these evil devils and why are they allowed to rule over good people that just want to eat fish? ?